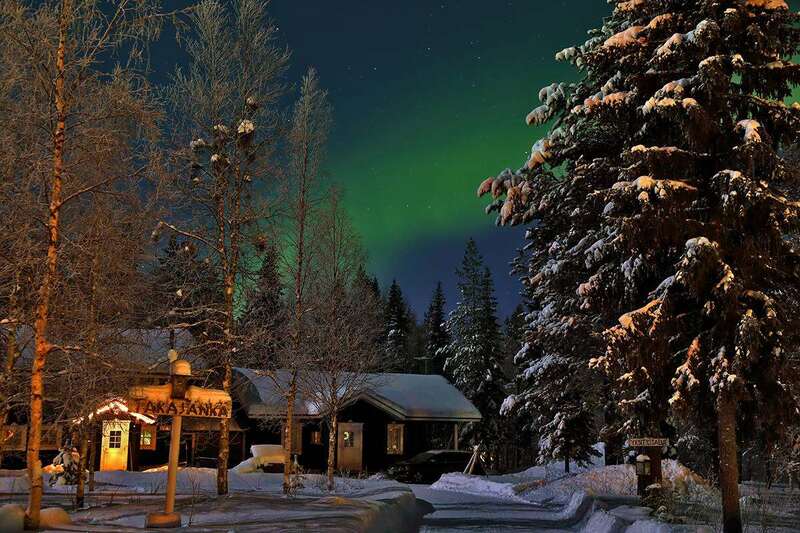 Villa Armas Cabins are excellent value, well -equipped, semi-detached log cabins conveniently located close to the Äkäs (Snow Elf) Hotel, from which all our Santa Break excursions depart. The cabins are all arranged next to each other in a peaceful area 150-250m from the Akas Hotel, making them an excellent choice for larger parties wanting to book cabins close to each other, and for those guests who want the convenience of a short walk to the departure point of all the Santa Break activities. Guests have the option of self-catering or pre-bookable half board, breakfast and 3-course evening meal, taken at the Äkäs Hotel. All cabin facilities include shower, WC, sauna, fireplace (wood included), TV, CD, full oven, toaster, fridge, microwave, dishwasher, vacuum cleaner, coffee maker, iron and drying closet. All linen, towels, firewood and final clean included. 3-room + mezzanine, 45m² + 14m² (A6) sleeps 2-6 people in 2 twin bedrooms, a single bed in the mezzanine, double sofa-bed in open-plan living room/kitchen. The price shown includes 4 nights accommodation, with flights from Manchester.